Longtime Soroptimist International of Vacaville members Tara Baumann (left) and Faye Sheppard (right) help Operation PROMises participants gather all their goodies to go at the end of the selection process. Attending a high school prom can be expensive. For the past three years, NorthBay Healthcare and friends have been connecting with local teenagers, helping provide the dresses and accessories they need to make their prom dreams come true, through Operation PROMises. Joining forces with Soroptimist International of Vacaville, NorthBay Healthcare Foundation and NorthBay Healthcare employees launched a massive formal dress drive (shoes, wraps, bags and jewelry also welcome) each winter, and then started recruiting volunteers to help with a one-day event in March. “We partner with local schools to make sure invitations go to the girls who need it most,” explained Jane Hilliard, director of Volunteer Services and one of the event’s organizers. For an entire day, the girls try on dresses and accessories and select their perfect prom outfit, all at no charge. This year, the event moved to NorthBay Healthcare’s Administration Center in Green Valley. “It outgrew Secondhand Rose, our downtown Vacaville Thriftique,” explained Jane. The first year, nearly 30 young women found their perfect dress. This past March, nearly 80 teens walked away with a dress, and all the extras. Local businesses donated certificates for dinners, flowers, and more. A team of six seamstresses was busy all day long making alterations to dresses while the girls waited. 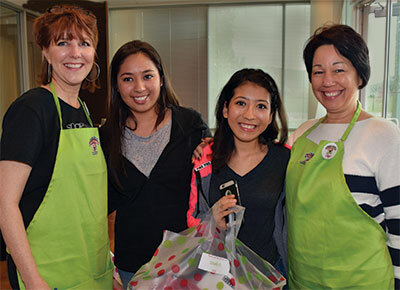 Representatives from Blake Austin College and Mary Kay cosmetics offered makeup tips while a team from Talk of the Town showed girls how to style their hair.